In addition to the dinner on Friday, there will be Mela for Saturday and Sunday at the Toronto Congress Centre. TICKETS AT SOME LOCATIONS ARE GETTING SOLD OUT. CALL 416-725-0909 OR ANYONE LISTED ABOVE . 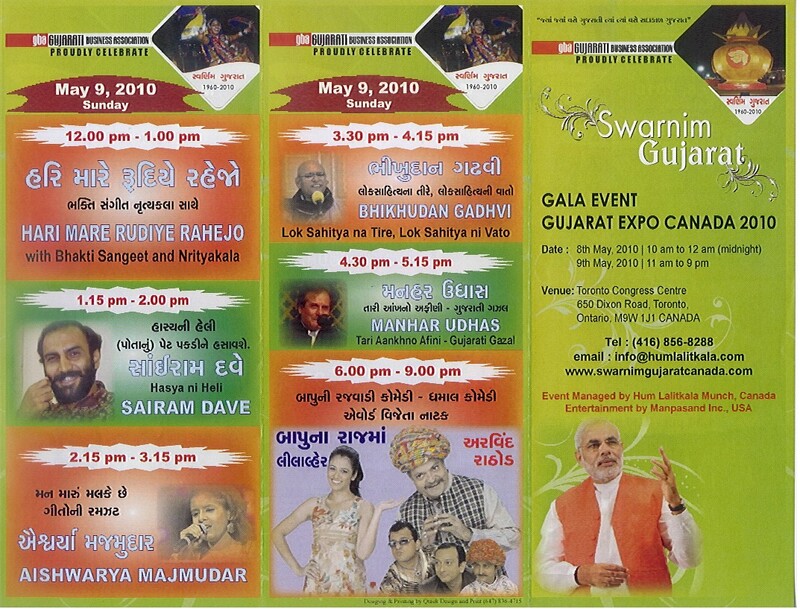 2) MUST MENTION THIS CODE - "GUJARAT DAY"
5) FOR ONLY FIRST 100 TICKETS. YOU CAN ALSO PURCHASE YOUR TICKETS FROM THE FOLLOWING, AT REGULAR PRICE. As mentioned earlier, we could meet four Gujarati speaking candidates and discuss with them their background and views. Tushar Shah is a candidate as a City Councillor for Ward 38, Scarborough Centre, City of Toronto, Ontario, Canada. He can be contacted at 747 Markham Road, Scarborough, Ontario, Canada, M1H 2A8. To view our discussions with Mr. Tushar Shah in Gujarati, please click here. To view our discussions with Mr. Tushar Shah in English, please click here. To view our discussions with Mr. Abdul Hai Patel in Gujarati, please click here. To view our discussions with Mr. Abdul Hai Patel in English, please click here. Abdul Ingar is a candidate for City Councillor for Ward 26, Don Valley, West, City of Toronto. He can be contacted at 2 Thorncliffe Park Drive, Unit 34, Toronto, Ontario, Canada, M4H 1H2. To view our discussions with Mr. Abdul Ingar in Gujarati, please click here. To view our discussions with Mr. Abdul Ingar in English, please click here. To view our discussions with Mr. Gulam Mohamed in Gujarati, please click here. To view our discussions with Mr. Gulam Mohamed in English, please click here. Mohamed Dhanani is a candidate for City Councillor for Ward 26, Don Valley, West, City of Toronto. Mr. Mohamed Dhanani was not available for discussions due to his busy schedule. Beju Lakhani is a candidate for City Councillor for Ward 7, City of Mississauga. He can be contacted at 2551a Hurontario Street, Mississauga, Ontario, Canada, L5A 2G4. Due to technical difficulties, our discussions with Mr. Beju Lakhani could not be completed. To view our discussions with Mr. Mohammed Ather in Hindi, please click here. To view our discussions with Mr. Mohammed Ather in English, please click here. Today, it is 29th October 2006. As I mentioned on 29th October 2004, I wanted to place my research work in cyberspace in 1973 when I was working on my MBA Thesis at Queen's University at Kingston, Ontario in Canada. Computer accessibility and connectivity were serious factors that made cyberspace available to only a limited few at that time. I had to learn and use DOS commands to access a central huge computer. In 1983 or so, I was reading "Megatrends", a book by a then-obscure futurist named John Naisbitt. At that time, few people had even heard of Bill Gates or Microsoft Corporation. And Megatrends does not mention Bill Gates or Microsoft. Yet, John Naisbitt had observed that the information sector would play increasingly significant role. There were some other futurists who had predicted coming of information age. However, the impact of world wide web was not perceived as well. In 1984, as the Manager, Administration, at the Ontario Housing Corporation, I was involved in purchasing hardware and software for six regional offices and the head office of the Corporation. For the first time, I used a mouse with its tail connected to a computer. With that little mouse, I could drag and drop a document to a recycle bin. I could also open a document and close it without using DOS commands. I was thrilled that now anyone could use a computer without knowing computer languages. Windows had addressed the accessibility factor. Later, advancements in networking and the Internet resolved connectivity problems. In 1997, I signed up with an internet service provider in USA over telephone. To save long distance charges and to have minimal interruptions, I learnt HTML and basics of web design at night over internet. In March 1998, I started this web site. Your participation in and support for this web site have been overwhelming from the beginning. Now, we are ready to move on to more specialised presentations. “Glory of Gujarat – ” perhaps the first Gujarati TV program in the world, which was originally broadcast on June 13, 1981.This is possibly the first formal Gujarati video web cast in the world. We know, as usual, you will join us whole-heartedly in such more specialized presentations. We are expanding and reorganizing. Thank you for your patience. With your involvement and participation, we had no choice but to expand. As a result of this expansion and reorganization, we are able to offer more web space to participating organizations. Please feel free to make use of this extra space. We will also be presenting more and varied video content. We thank you for your support and patience. For more video presentations, please click here. PLEASE NOTE THAT UPON CLICKING ANY OF THE FOLLOWING LINKS TO VIEW A DOCUMENT, IF "ENTER NETWORK PASSWORD" BOX OPENS UP, YOU MAY CLICK "CANCEL" BUTTON TO PROCEED. Today, it is 29th October 2004. Your participation and support for this web site has been overwhelming since this web site started in March 1998. Now, we are ready to move on to more specialised presentations. In fact, I wanted to place my research work in cyberspace in 1973 when I was working on my MBA Thesis at Queen's University at Kingston, Ontario in Canada. My thesis involved Dynamic Programming, Integer Programming, and Computer Programming in FORTRAN. During my research, I learnt about cyberspace through technical journals. I was told it was accessible to the military and some professors at that time. Indeed, computer accessibility and connectivity were serious factors that made cyberspace available to only a limited few at that time. I had to learn and use DOS commands to access a central huge computer. Later, Windows addressed the accessibility factor, and the internet resolved connectivity problems. During the last 30 years in Toronto, three generations of my family have been fortunate enough to work with many of you closely and contribute widely to many many organizations. My mother, Sushila, now 86 years old, taught Gujarati to children in the 1970s and 1980s and worked with you during many community activities. You showed a lot of confidence in me and my wife Rekha in electing or appointing us to many senior positions in organizations such as the Scarborough Home & School Council, Friends of Scarborough, India Canada Association, Federation of Indo-Canadian Associations, Panorama India, National Indo-Canadian Council, Federation of Gujarati Associations, Vanik Samaj of Toronto, Gujarat Samaj of Toronto, Gujarati Cultural Society, Jain Society of Toronto, and Association of Women of Indian Origin in Canada. Our children Reena & Himanshu have also been involved in performing on and off stage activities in various community projects. With your strong support, we were able to organize lectures, workshops, seminars & conferences, and to present dances, songs, skits, stage shows, radio programs, tv programs, and web casts. We were also involved in designing colourful magazines and newsletters for some organizations. My daughter Reena was invited to present her "rangolis" at Harbourfront, Canadian National Exhibition, Royal Ontario Museum, Kitchener Mela 2003, and Pickering Festival among other places and events. She was also invited to present her dances and songs at various events. Some of her rangolis and dances can be viewed at our web site. 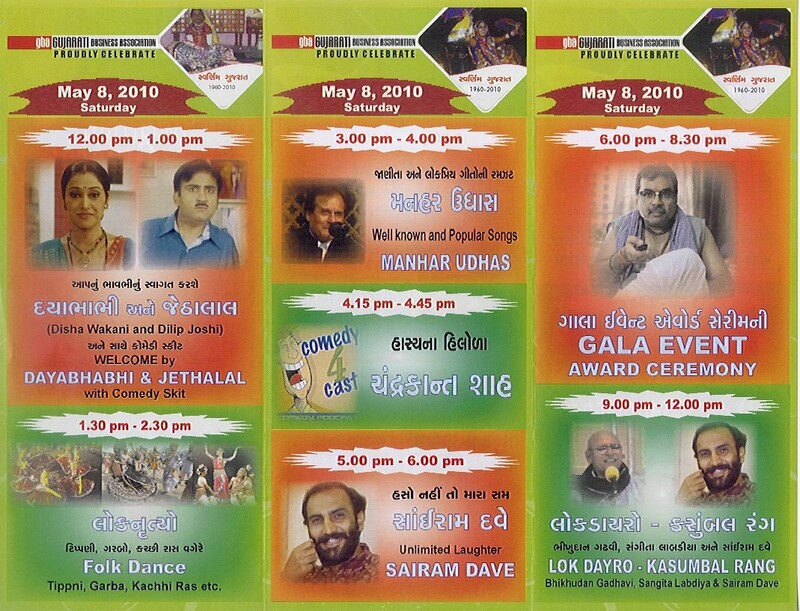 We presented perhaps the first Gujarati TV program in the world in 1981 in which many of you were involved. Soon after that I was lucky to be perhaps the first Gujarati to become a member of ACTRA (Alliance of Canadian Cinema, Television, & Radio Artists). Soon after that we also presented Women's World and Heritage of India on Global TV through Sounds of Asia. During last six years, with your participation, we could integrate our contacts, leadership, artistic, & administrative skills and knowledge with our vision to present one of the few large web sites with many many hours of unique video files on many subjects. "Thank You Canada", "NRI Women in Visual Arts", "A Tribute to M G Vassanji", and "Symposium on Current Public Health Issues" are examples of this unique integration where we have been able to involve many of you and your community groups along with charitable organizations, corporate sponsors, various government agencies, politicians, and other professionals. Now, we plan to offer more specialised presentations such as Glory of Gujarat, Women's World, Heritage of India and more. We will be happy to incorporate your ideas, dreams, projects, and community announcements. We know, as usual, you will join us whole-heartedly in bringing this vision to a reality. We will announce more details in the near future. To view this video presentation along with announcements on ZSO Natak (by Nilufer Mama & Russi Surti) and Indian Film Festival (by Amar Mukherjee) (Duration 12:46), please, click here. * India Canada Association, Waterloo Region held its Annual General Meeting and celebrated Republic Day of India on January 21, 2007. For details, please call Ian Mendes at 519-585-7577, Chandrika Anjaria at 519-579-2797, or Shanta Dubey at 519-885-2772. * Panorama India with the support of the Consulate General of India will celebrate the 58th Republic Day of India on January 28, 2007. For details, please call Raghu Nayak at 416-283-4271 or Ranju Advani at 416-299-5051 or click here. * The Indo-Canada Chamber of Commerce has partnered up with several organizations to bring you the Inaugural Business Conference Dinner to launch Toronto's first Global Economic Conference "The Great Transition" on February 7, 2007. For details, please call the Chamber’s office at 416-224-0090. * The Vishva Hindu Parishad is organizing the “World Hindu Conference –III” on February 11, 12, and 13, 2007. For details, please call Ashok Singhal at 011-91-11-26178992 or 011-91-11-26103495. * The Vedanta Society of Toronto has organized “Maha Shiva Ratri Puja” on February 16, 2007. For details, please call the Society at 416-240-7262. * Spiritual Heritage Education Network (SHEN) Education Inc. presents a seminar by Marjorie D. Paleshi on “Living Well, Dying Well : Two Sides of the Same Coin” on Wednesday, February 21, 2007. For details, please contact Shiv Talwar at 519-884-2361 or at shivtalwar@spiritualeducation.org. Our sincere condolences to Brahma Kumar Ramesh Shah (Mumbai, India) and his family members for the loss of his mother Shantaben Shah on December 24, 2006. Our sincere condolences to Dr. Sunil Patel (Gimli, Canada) and his family members for the loss of his father Dr. Vithalbhai Patel on December 25, 2006. * The Hemoglobal Research Department at The Toronto General Hospital has been conducting research in Thalassemia. One of the goals is to provide optimum care to all children with Thalassemia in Orissa. For details, please contact Robin Kotisa at 416-340-3979. * The Art of Living Course is an ideal introduction to Sri Sri Ravi Shankar’s wisdom. For details, please call 905-785-2583 or click here. * Arya Samaj Senior Citizens' Club meets on every first and third Tuesday of the month at the Vedic Cultural Centre, 4345 14th Avenue, Markham from 2:00 p.m. to 5:00 p.m. For details, please contact M. R. Sethi at 905-737-8380, Fax 905-780-1087, or at new e-mail address sethimr69@rogers.com. * Listen to “Dharkan-The Heartbeat” radio program every Sunday from 4 to 6 p.m. at CIAO AM 530. For details, please call Rashmi Anand at 416-930-5044. -For details on these projects, please click here. * SOTC World Famous Tours, India's largest outbound tour operator offers many attractive packages. For details, please call Trade Wind office at 416-920-7682 or 800-268-4853 or click "Business & Trade in the Themes section" on the left panel. * State Bank of India (Canada) offers various services described by Mr. Nandakumaran during his discussion with Kumara Rachamalla (President, NICC Toronto Chapter). For PART I, please click here. For PART II, please click here. For details, please call their office at 416-865-0414 or click "Business & Trade in the Themes section" on the left panel. *Academy for Mathematics & Science offers a FREE evaluation of your children's aptitudes. For details, please call James Kumar at 416-754-1108 or click "Business & Trade" on the left panel. *Five Star Auto Service offers free estimates on general automobile repairs. For details, please call Imam Khan at 416-609-9474 or click "Business & Trade" on the left panel. *For FREE consultation on your real estate and commercial needs, please call Zakir Patel of REMAX Associates at 416-293-1100. *Himalaya Arts offers various services including professional videography, photography, and DJ services. For details, please call Parvinder Singh at 416-505-2223 or click "Business & Trade" on the left panel. *Travel Corporation (India) Ltd. offers a number of specialised tour packages for seniors, youth, and students. For details, please call Niloufer Kavarana at 905-770-6434 or click "Business & Trade" on the left panel. *Zellers Pharmacy offers FREE health brochures & videos, blood pressure testing, and patient information. For details, please call Rajesh Mehta at 416-298-8165 or click "Business & Trade" on the left panel. We thank you for your involvement and participation in the development of this forum. Do not hesitate to send in your letters, comments, suggestions, views, articles, photographs, ... about events or activities in which YOU were involved.